Garnets typically forms 12 or 24 sided crystals in metamorphic rocks, and also igneous rocks. They range in color from red to pruple, green, yellow, brown, white, and clear. Hardness 6.5 - 7.5; no cleavage; conchoidal fracture. 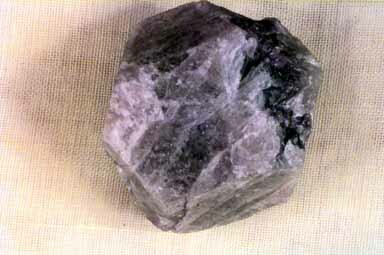 This specimen shows a 12 sided (dodechahedral) crystal.